The Little Green Kit is International Paper’s sustainability story. As the world’s largest packaging, paper and pulp producer it is important that International Paper clearly communicate its responsible approach to environmental issues. International Paper prides itself on using natural resources wisely, sustainably and, responsibly – it is critical to its business as well as the environment. The Little Green Kit addresses industry myths, looks at sustainability and highlights the benefits of paper based products. It consists of both printed materials and accompanying website and is available in 8 languages - English, German, Spanish, French, Italian, Russian, Turkish and Polish. Digital Marmalade has been working with International Paper since 2008 and this communication piece was shortlisted in the Ecology and Environment category at the European Excellence Awards. 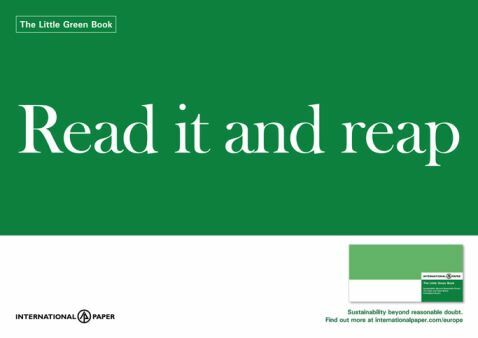 The Little Green Book aims to dispel seven myths about the paper and paper-based packaging industry, including that buying paper destroys forests, that paper has a high carbon footprint, and that reusing is better than recycling. 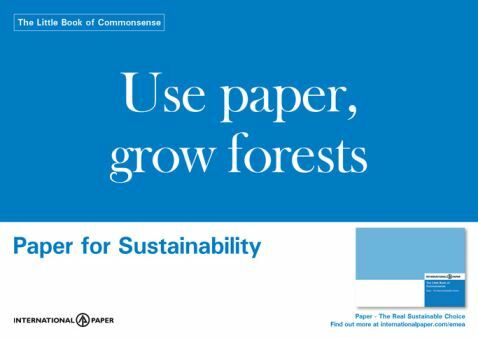 The Little Book of Common Sense discusses how paper can be a sustainable choice and the benefits of using it at work, at school, to be creative, and to bridge the digital divide. A Matter of Credentials is the story of sustainability at International Paper EMEA, the approach to it, and how it is good for business. Additionally, we created a set of printed ‘scenario responses’ titled Killer Questions Made Easy, with real life answers for real life scenarios. These flashcards provided concise yet comprehensive answers to the type of questions employees at International Paper may be asked about sustainability in real life situations. To help raise awareness of The Little Green Kit a series of posters for each book were designed. These bold and simple posters aimed to entice people to delve further into the subject of paper sustainability via provocative messaging. The Treeble Effect is an animation that aims to help communicate International Paper’s dedication to sustainability through sourcing material from responsibly managed forests. The video explains how every tree that is logged in managed forests is replaced by three to four replanted trees. And as young trees grow, they absorb CO2 from the atmosphere. Common sense might tell you that the bigger and older the tree, the more carbon it absorbs. But you’d be largely wrong. In fact, young forests are much more efficient at absorbing carbon than old forests. As well as the printed materials The Little Green Kit is available online as a microsite in 8 different languages. The Little Green Kit iPad App contains all the information that is provided in both the printed kit and on the website. With a fresh new design using updated imagery, the iPad app looks great on retina devices and provides a unique tool to International representatives around the world.